The Public Priorities meeting for Omaha’s Transportation Master Plan is only three days away. On the theme of “three,” let us look at three comparisons of costs depending in development density. Yes, as we have said, transportation relates to just about everything, and that includes zoning. The costs to build and maintain a city are directly related to population density and development placement. While in the past, sprawling, green-field development is been cost effective for the builders, these developments have left cities holding the bag with increased infrastructure and maintenance costs. In the infographic above, the large, shaded areas represent the costs for developing in a sprawling fashion, where roads and infrastructure are continually stretched farther and farther. The arcs carved from each area represents the costs for infill development. Infill in when developers build in areas that are already served by infrastructure: adequate roads, electricity, water and sewer. These infill developments can be improvements to existing, vacant buildings, demolition and rebuiling, or building in vacant or underused lots. 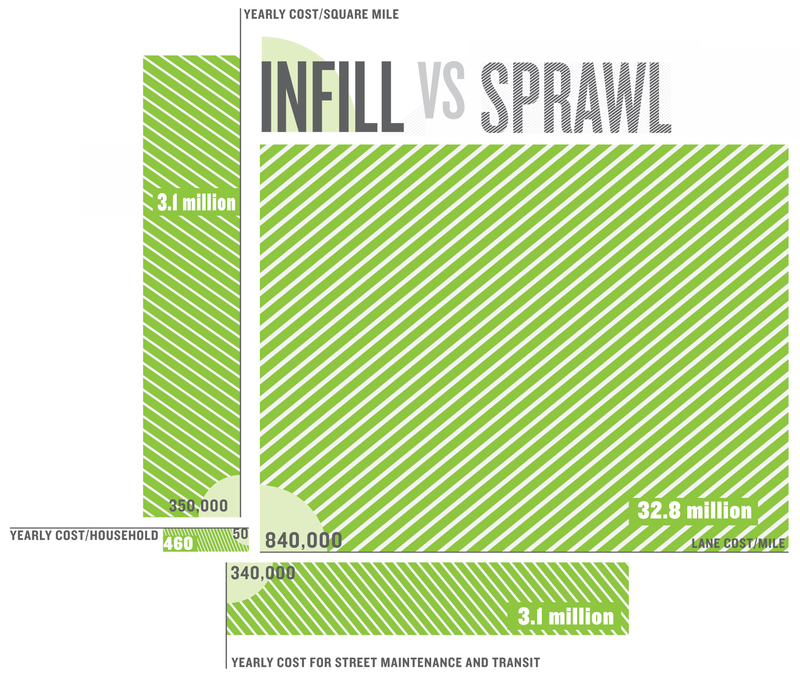 The long-term costs of infill are a fraction of the up-keep sprawl demands. This is why we need policies that encourage infill development. Come to the Public Priorities meeting this Thursday, September 15, 6:30 p.m. at the Scott Conference Center on the south campus of UNOmaha.